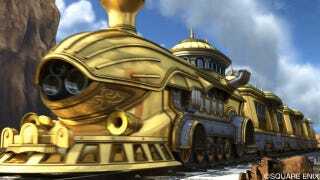 In the latest Dragon Quest X trailer, there's a train. It has several headlights and a curved shaft, and it looks like a train in another game. You can see it above. A similar train appeared in 2003's Sakura Taisen ~Atsuki Chishio ni~. It was spotted by Japanese netizens, and it looks, well, like the design inspired the train in DQX. Or it could just be a kwinky dink! Sakura Wars didn't come to the U.S. for a long, long time.